There's few things I like more than a comic by Greg Rucka, and especially a comic by Greg Rucka that includes Renee Montoya as the Question, and also references Renee's history with Gotham Central. By virtue of its Final Crisis ties, this story didn't strike me as quite at the level of its Question: Five Books of Blood predecessor, but Final Crisis: Revelations has got a lot going for it nonetheless. Revelations tries its best to explore the spiritual side of Final Crisis. Thematically (if not completely on the page), Final Crisis looked at free will and how, in a world of tabloid news and Internet journalism, we daily cede ourselves to the real-life equivalent of Darkseid's Anti-Life equation. Revelations finds God's agents--the vengeful Spectre and the merciful Radiant--impotent against the Anti-Life equation precisely because, the Radiant explains, God imbued mankind with free will and it's mankind who has to take it back. Greg Rucka's voices of the people, the Question and the Huntress, battle the epitome of human evil, the biblical Cain, for mankind's ability to make their own choices. It sounds riveting on paper, and the story does deliver plenty of what most fans bought the story for: the first meeting between former Gotham Central partners Renee Montoya and Crispus Allen in their new roles as the Question and the Spectre respectively. Rucka's dialogue shines here with Renee's sometimes snappy, sometimes self-effacing one liners, and I continue to enjoy the backdrop of his haunting Religion of Crime. Rucka also makes the smart decision to separate Renee from the shadow of Batwoman a bit, and instead brings in the Huntress (whom he wrote to great success in the Huntress: Cry for Blood miniseries). Rucka doesn't spend too long on Huntress's religious background, but longtime fans knows she has one (as does Renee, for that matter), and it makes the character a perfect fit for this spiritual story. Much of Revelations brings to close plotlines begun around Infinite Crisis, and it's fitting to find Huntress in a church here just as she was during that earlier crossover. Different from Final Crisis: Rogues' Revenge, which I thought made great use of the Final Crisis background, Revelations is a good story that feels hampered by Final Crisis. Despite that the Crime Bible mythology had its origins in Apokolips in 52, the role Darkseid plays here, and his relationship to the story's villain Cain, is never completely clear and seems largely tacked on. As with Countdown to Final Crisis and Death of the New Gods, the end of Revelations seemingly solves the Final Crisis on its own, and it's hard to see the necessity of Revelations as part of Final Crisis rather than its own entity. In addition, the Final Crisis timeline severely hampers the story; Renee and the Spectre could've fought Cain any day of the week, but setting this during Final Crisis severely restricts the story's ability to breathe. Revelations ends up taking place only over a couple of hours, much of it spent with Renee and the Huntress running dizzyingly in and out of a church. Renee and the Spectre get a little time to chat, but there's not as much reflection as I would have liked; let's not forget Renee nearly drank herself to death, at one point, feeling guilty over the death of her former partner. To be sure, however, I did appreciate some of the work Rucka tries to do on the Crispus Allen Spectre. Like Will Pfeifer and David Lapham before him, Rucka doesn't seem quite the rules and abilities of this new Spectre, but he does pick up on the rather quick death of Allen's son in Pfeifer's miniseries, and applies good story logic to why this death might have been so quick. Was Allen indeed meant to let the Spectre kill his son, the Radiant wonders. Was it a test that Allen failed, or did Allen's son's death prevent further deaths down the line? They're good questions (as Renee is wont to say), though Rucka doesn't answer them so much as open Allen's eyes to new spectral abilities, such that everything's copacetic in the end. Not, perhaps, the explanations I was hoping for, but at least Rucka begins to distance the Spectre from the Lapham/Fleisher incarnation (not before he takes revenge for the murder of Martian Manhunter, however), seemingly moving the character toward a cosmic interpretation more comfortable with the Justice Society. 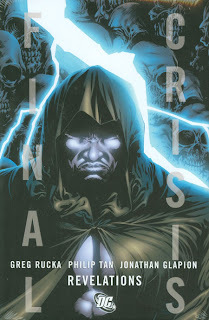 So--while Revelations didn't quite pack the punch of the Final Crisis crossover Rogues' Revenge, fans like me of Greg Rucka's new Question will surely be glad for this volume, and eagerly awaiting the next.